Huge Savings Item! Free Shipping Included! 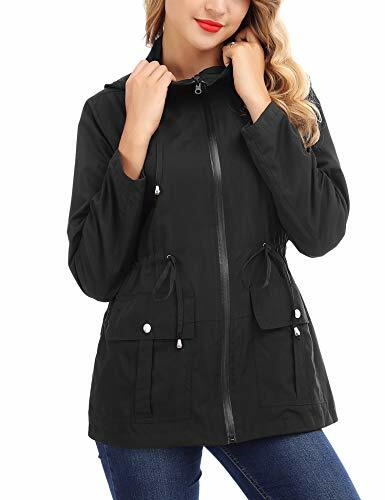 Save 15% on the FISOUL Women Rain Jackets Waterproof with Hood Lightweight Raincoat with Pockets Outdoor Windbreake Black S by FISOUL at Sherlock Coat. Hurry! Limited time offer. Offer valid only while supplies last. Description: Adjustable drawstring waist and bottom hem for better fit / Two snap button pockets and one zipper pocket to hold your belongings. Adjustable drawstring waist and bottom hem for better fit / Two snap button pockets and one zipper pocket to hold your belongings. Military versatile slim fit anorak jacket with pockets and drawstring. Semi lined / Full zip up and snap button closure / Center back slit / Attached hoodie for multiple looks. Machine wash cold. Do not bleach, Hang dry. 【women's raincoats】: Perfect the long sleeves can be rolled up and snapped in place. Attached lined hood with adjustable drawstring waist design shows a real styled look. 【Hooded Rain Jacket】:Those trench coats are featured with good quality zipper front closure, so that you can unzip it from the bottom-up.Two front deep pockets are perfect to hold all kinds of things. 【rain jacket women】:The raincoats fits well across the shoulders and is roomy enough .Covers the hips, and the hood is generous but doesn't overdo it. 【Fashion Lightweight Coat】:This fashionable drawstring hooded rain jacket suits for Climbing, Cycling, Camping, Hiking, Running, Traveling ,Fishing and Other Outdoor Sport. 【Outdoor Windproof Coat】:This Jacket is with Sun Protection ,Windproof Function,and Waterproof to deal with light rain.Easy to Packable, Quick-drying, suit for all seasons.